Every football club has its “Leiston” moment. That game where everything goes wrong and you finish up on the end of a giant killing. As a West Ham fan I’ve experienced that pain all too often – in fact I couldn’t define just one game which sums up the word properly. Aldershot Town, Wrexham, Grimsby Town and Swansea City (when they were a Vetch Field-based Division Four side not a modern Liberty Stadium Premier League side) all spring to mind although there has been a few near misses (Farnborough and Emley anyone?) but I didn’t think Non League clubs had a giant killing moment. That was before I started following Lewes. Back in 2008/09 Lewes had made it to the pinnacle of Non League football. Whilst they could never say that season in the Conference Premier was a success, they were on the same Ceefax page as Oxford United, Mansfield Town and Torquay United for one memorable season. The FA Cup gave the club the opportunity to play with the even bigger boys. Lewes entered the competition at the Final Qualifying Round. One win and they would be in the hat along with 48 Football League sides. 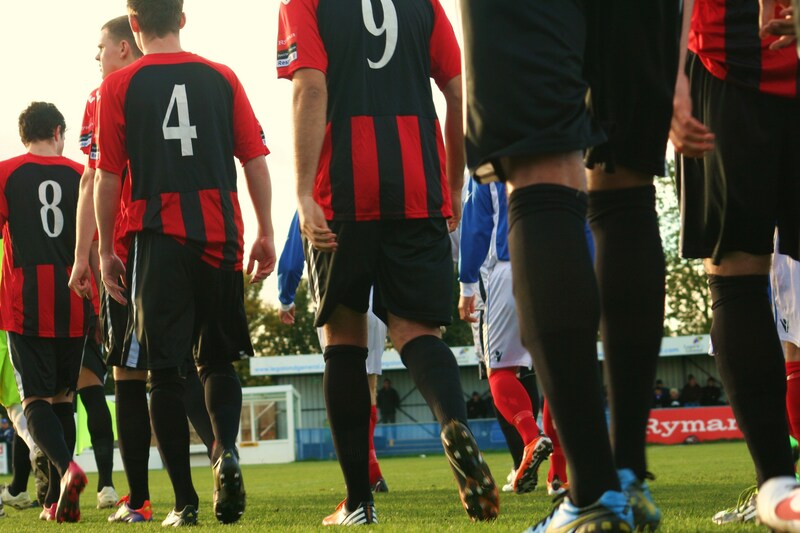 In their way was an away trip to Eastern Counties League side Leiston – four divisions below the Conference Premier. Firstly, the fans (and players!) needed to find the place on the map. Leiston, around 80 miles east of London on the Suffolk coast, doesn’t really feature in much popular culture. In fact the Wikipedia entry tells us under culture that the town has a post office, library and two pubs. The town doesn’t have a railway station and is probably more famous for being the closest habitat to Sizewell Nuclear Reactor. Alas, you can no longer visit the reactor, but the pub across the road, the Vulcan Arms, was one to visit if only for the fact it won “Best Pub Sign of the Year” in 2011. After a 1-1 draw in Suffolk, few people would have put money on anything apart from a Lewes home win in the replay. In fact, few people actually bothered attending the replay at all (just 347). But on a miserable night in East Sussex, the County League side turned over the Rooks, coming away with a 3-1 victory that will forever go down in the history of both clubs. Leiston progressed into the First Round of the FA Cup, drawing at home to Fleetwood Town before losing to them in a replay. Since that day in October 2008 the fortunes of both clubs couldn’t have been more different. Whilst Lewes have endured relegation from the Blue Square Premier and South divisions to land in the Ryman Premier League, Leiston have surged up the leagues, gaining successive promotions meaning that four years on from that FA Cup tie the two clubs would be meeting again in Suffolk in a league game for the first time, with some irony on the FA Cup First Round day. As we headed up the A12, we listened to previews of Hendon, Met Police and Hastings United’s games in FA Cup 1st round with some jealously that it could have been the Rooks. But it wasn’t to be. In fact Lewes had another “Leiston” moment during midweek when they lost at home to Brentwood Town in a FA Trophy replay. The last thing we needed was a reminder of our vulnerabilities. Only twelve hardened Lewes fans made the journey, a third of which were travelling in TBIR Taxis. With plans for the annual Lewes bonfire and sparkler party in their final stages, the normal travelling crew were at home, making homemade fireworks out of sticky-back plastic and getting their marshmellows ready for toasting so it was left to the Lewes Lunatic Fringe to provide the support for the team. Our first stop was, of course, Sizewell Nuclear Reactor. 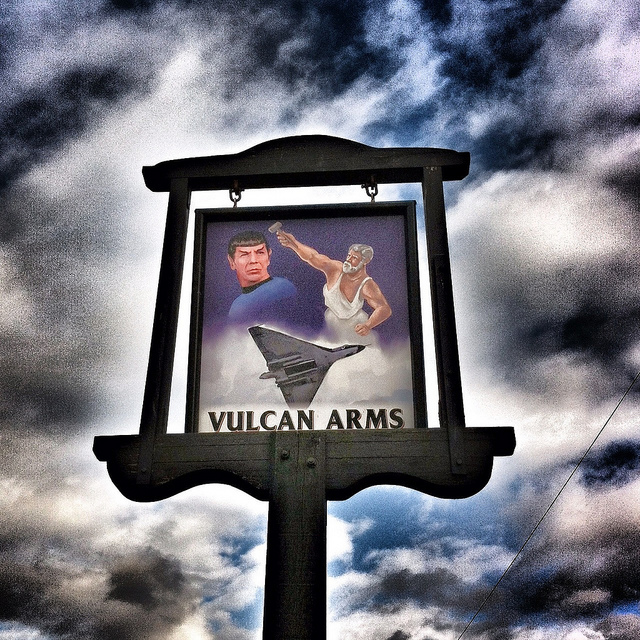 Or at least the famous Vulcan Arms opposite. It was disappointing to report that there was no strange glow in the distance, or anyone resembling Homer Simpson in the area, although it has to be said that the pub sign was truly one of genius. But one Greene King IPA was enough before my iPhone app gieger counter told me it was time to move on (for any HSE executives reading that was a joke). Next up, the Engineers Arms in Leiston itself which gets a massive TBIR 9/10 for beer, obscure football memorabilia and horse-brasses abound. And finally it was showtime. 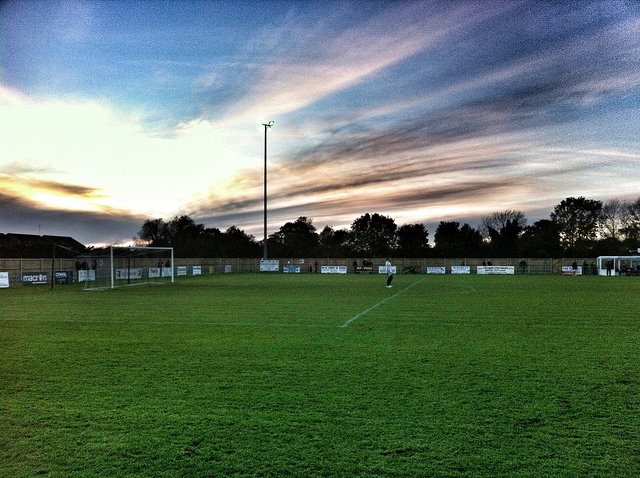 Leiston 1 Lewes 1 – Victory Road – Saturday 3rd November 2012 A draw away from home is never a bad result, especially when you have a 150 plus mile trip home. The Rooks deserved their point in a game that failed to warm the cockles of the 186 watching on. But this was a completely different side that had capitulated to Brentwood Town on Tuesday night. Injuries once again robbed Simon Wormull of two of his most influential players in Nathan Crabb and Jack Walder, but that gave an opportunity to Ryan Stubbings and Joseph Kay, both part of the Under18 squad that has been wowing crowds this season. In fact both had featured in the amazing 6-5 Kent Cup (don’t ask) against Maidstone United on Thursday night. The game was just a few seconds old when Osei had a golden chance to put the home side in the lead but a great block by Leyton Schaaf diverted the ball onto the bar and away. But it was another player who had missed the game on Tuesday night who put the Rooks in the lead, the ever-reliable Chris Breach powering home a Beckford corner in the 25th minute slightly against the run of play. With the temperature plunging downwards quickly, we sought refuse at half time in the board room, and the fantastic hospitality Leiston put on. As the only club director to make the journey I was welcomed like a long-lost brother by the committee members of the club despite my non-directorial dress. Not that it mattered to them – they of course wanted to talk about THAT game four years ago. Of course they did. The second half saw the ball spend a lot of time in the midfield. Worms played his ace half-way through the half when he brought on Callum Dunn for his debut. Callum had signed in the summer but an injury in one of the first pre-season friendlies had robbed the team of some midfield creativity. Alas, he could do nothing about Leiston’s equaliser fifteen minutes later when Osei got the better of Hamilton, crossed and substitute Nathan Stone headed home. The home fans felt that Lewes had been guilty of time-wasting in the lead up to the goal, although I’m not sure that passing the ball across the pitch can be classed as negative play? If it’s good enough for Barcelona and Spain, then surely it’s good enough for the Rooks (although I am not putting us in the same class as those two!). To win a game of football you need to have the ball, and by keeping hold of it Lewes were simply playing the percentages. So a draw was in my opinion a fair reflection. 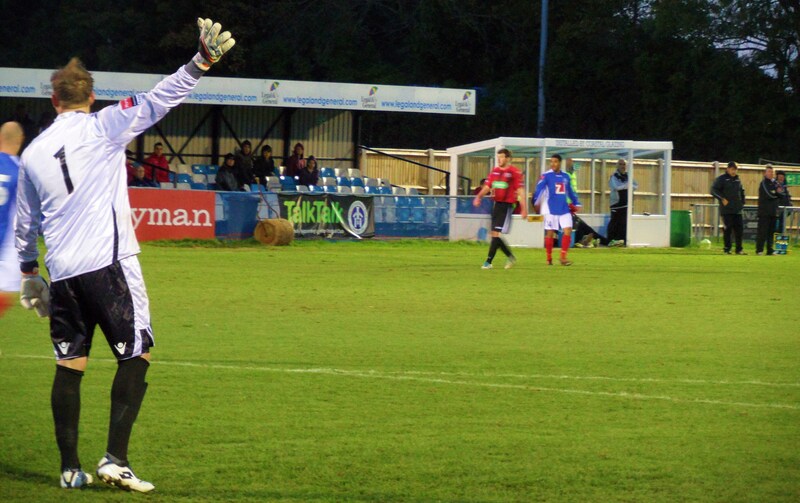 Whilst the home side may feel slightly aggrieved, they rarely troubled Kieron Thorp in the Lewes goal. However, with a plate of sausage, beans and chips served up in the boardroom, Leiston certainly were a winner in my eyes. Four years of hurt were forgiven over a prize Suffolk banger. One hundred and twelve miles later I was home, satisfied with a day out in deepest, darkest Suffolk. Next Saturday we have to do it all again as we once again travel to these parts for the trip to Bury St Edmunds, home of Adnams. Oh, go on then.